Russian President Vladimir Putin, left, and President Barack Obama shake hands at the COP21 U.N. Conference on Climate Change in Paris, Nov. 30, 2015. President Barack Obama voiced regret Monday to Russian President Vladimir Putin over the Turkish shootdown of a Russian jet fighter last week, and he urged the Kremlin leader to reduce tensions with Turkey over the incident. The two leaders met for 30 minutes on the sidelines of the United Nations Climate Summit outside Paris. Turkey said it shot down the aircraft after it entered its air space, with a Russian pilot and crew member killed in the attack and subsequent rescue effort. Putin responded by imposing economic sanctions against Ankara. Obama and Putin discussed the continuing warfare in Syria in detail, Washington and Moscow said, with both agreeing on the need for a political settlement of the four-and-a-half-year-old conflict between rebel groups trying to oust President Bashar al-Assad and forces loyal to his government. 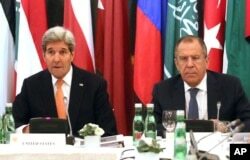 U.S. Secretary of State John Kerry, left, and Russian Foreign Minister Sergey Lavrov confer in Vienna, Austria, Nov. 14, 2015. Foreign ministers from more than a dozen nations are meeting in Vienna seeking to find a way to resolve the conflict in Syria. The White House said the leaders "discussed the imperative of making progress" at talks in Vienna to reach a cease-fire and a political resolution, but Obama and Putin are at odds on the fate of Assad. Obama told Putin that Assad must leave power as part of any transition, but Moscow has continued its aerial bombardment of the anti-Assad rebels. Washington said Obama stressed the need to Putin that Russia focus its attacks in Syria on Islamic State targets, not on the Assad opposition groups. Obama also told the Russian leader of the importance of ending the conflict between pro-Russian separatists fighting Ukrainian forces in eastern Ukraine and the implementation of the Minsk cease-fire agreement reached in early 2015. The U.S. leader said economic sanctions against Russia could be eased if the cease-fire is actually carried out.